In response to a number of recent incoming google searches to the forum and the fact that there are currently a couple of examples listed on eBay with vastly differing asking prices, I thought I'd better 'put a stake in the ground' and get a model-specific topic written up a bit sharpish. I'll try and finish this one today, rather than leaving it 'under construction' as I have done with a number of similar topics. So bear with me. I can't remember now, whether he actually emailed them to me, or if I may have right-clicked and saved them from a thread on the old Network54 SCWF, but their properties show they were taken on 6/06/2009. When I first saw these photos I was a little confused as to the colour of the hands. 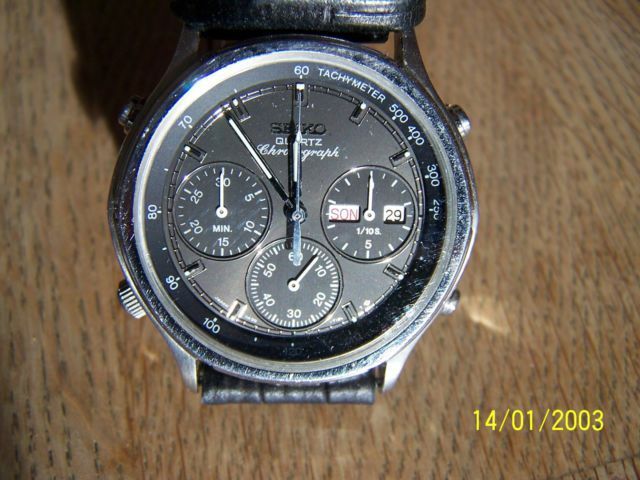 Although the watch seems overall to be in good cosmetic condition, the lume on the hands and ends of the dial batons of Dave's example appeared to be completely blackened - presumably caused by moisture ingress at some point. .... (halfway down his post) a week after everybody else. With my first stainless 7A38-7260 I made the usual classic mistake - the one that I frequently advise others not to make. I bought the first one I ever saw, listed on eBay by an italian seller (many of these turn up in Italy) back in December 2009. According to my records, the eBay item # was 330388631566 and I paid 70 Euros + 12 Euros postage for it - about £75 in total. 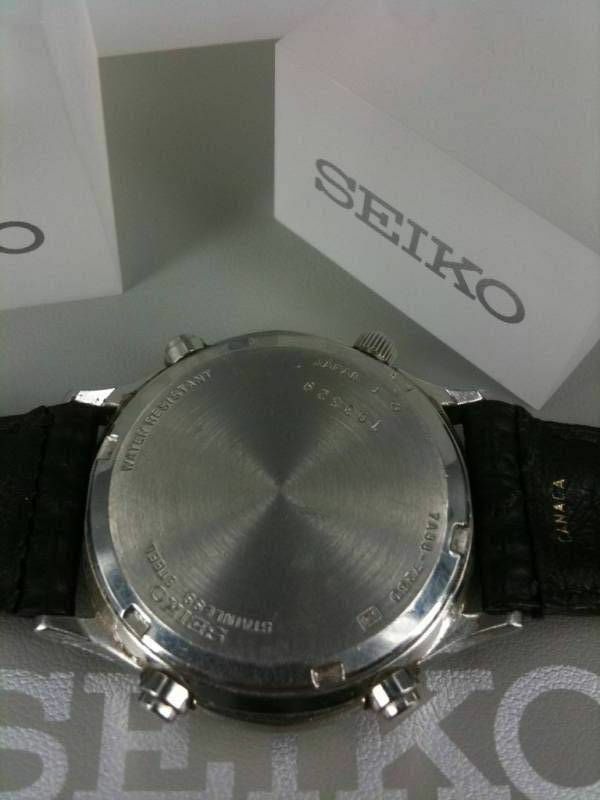 Something worth mentioning here, is that in the eBay seller's only listing photo, you can clearly see the non-circular case shape. Indeed, as I found later, when I came to refurbish it, even the curvature of the case between the lugs isn't a constant radius. 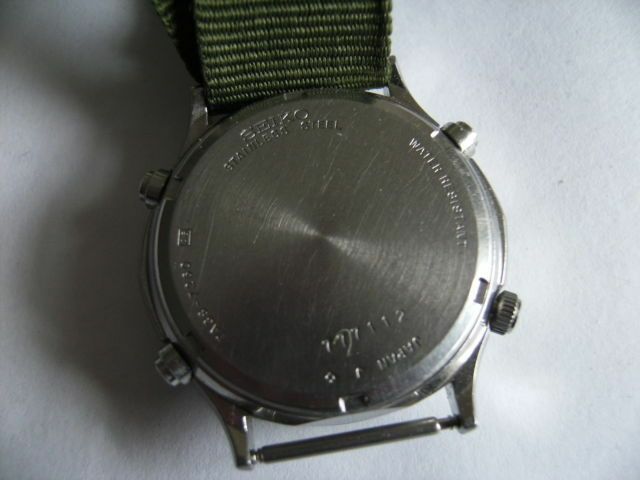 However, although in overall fairly decent cosmetic condition, the bezel had a couple of nasty dings in it - a frequent problem with this case design, right across the model range (more so with all the other 7A38-724x / -725x and -726x variants with gold-plated bezels). Both dings are clearly visible in the seller's photo: one was near the 11 o'clock lug and another much deeper one, right on the edge, just below the 2 o'clock pusher. 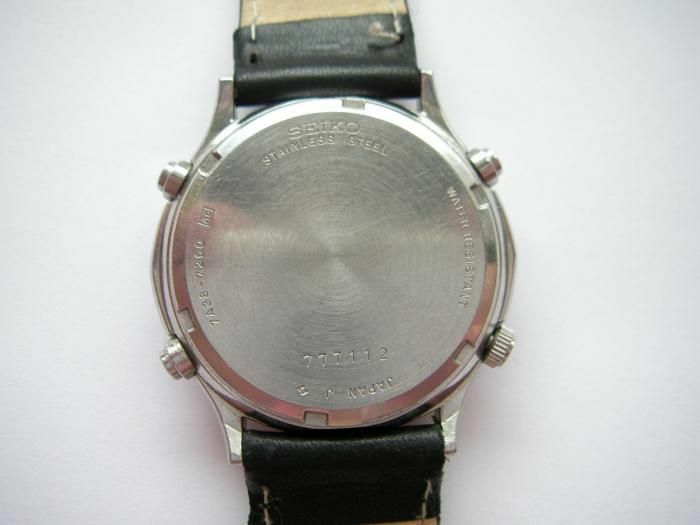 Initially, my plan had been to fill these dings with weld or silver solder and re-finish the bezel myself. As it turned out, I never did. After exploring a few avenues and then giving up on the idea, I phoned Debbie at Jules Borel in Kansas. They had a NOS p/n 82343109 bezel in stock - I bought it, needless to say. So instead, I just ended up refurbishing the watch case myself, being very careful to maintain the correct curvatures and angles. As I'd done with all my other 7A38-726x's, I fitted it with a lizard strap. 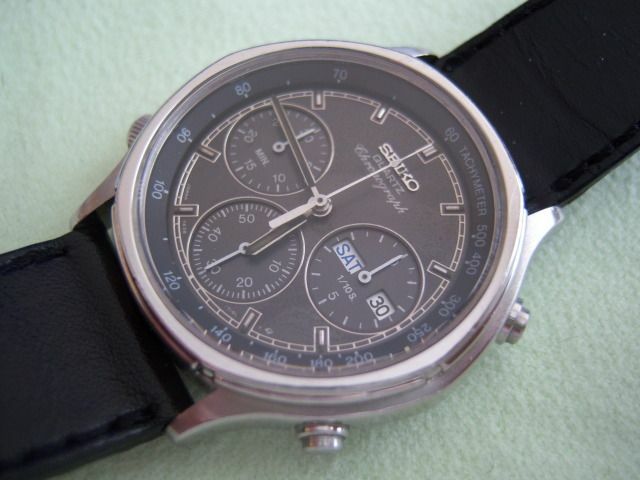 The dark grey colour goes quite well with the dial, I think. Here are some photos I'd saved from older eBay listings (some of which I don't have item numbers for, nor the prices they sold for). There were 12 photos in the original eBay listing, but many were very similar and some out of focus, so I've uploaded 6 of them. 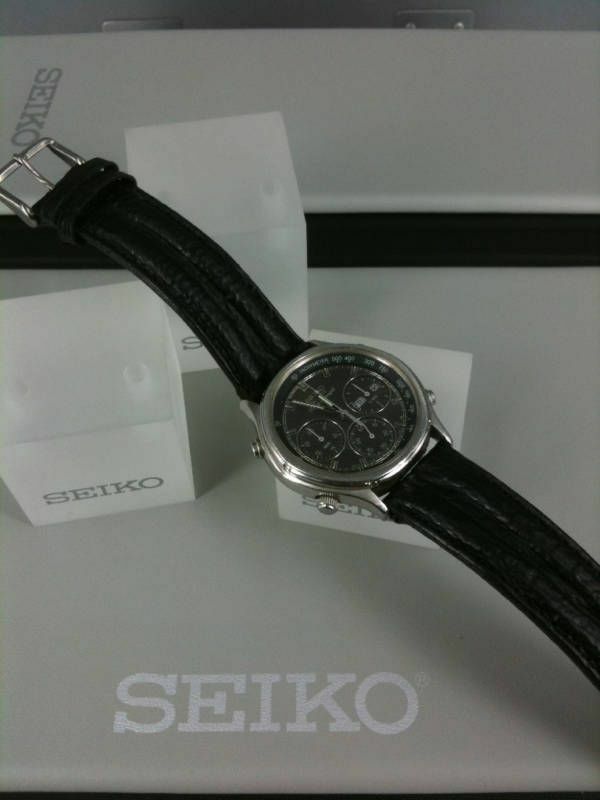 Although the strap fitted was embossed Seiko, it wasn't the original correct p/n BRA35S fitted, but a double-rib black shark strap. Although a bit scratched this would have been a fairly easy restoration. Note, like many others the 777xxx case-back serial number. This NOS example was listed on eBay Italy in June 2011. Oddly, the listing still survives in eBay history. But I remember it distinctly. Thanks to a heads up from forum member, James, I bought it in a flash - for the 100 Euros Buy-it-Now price (and FREE shipping). I'll write up more in detail about this one in the next post. 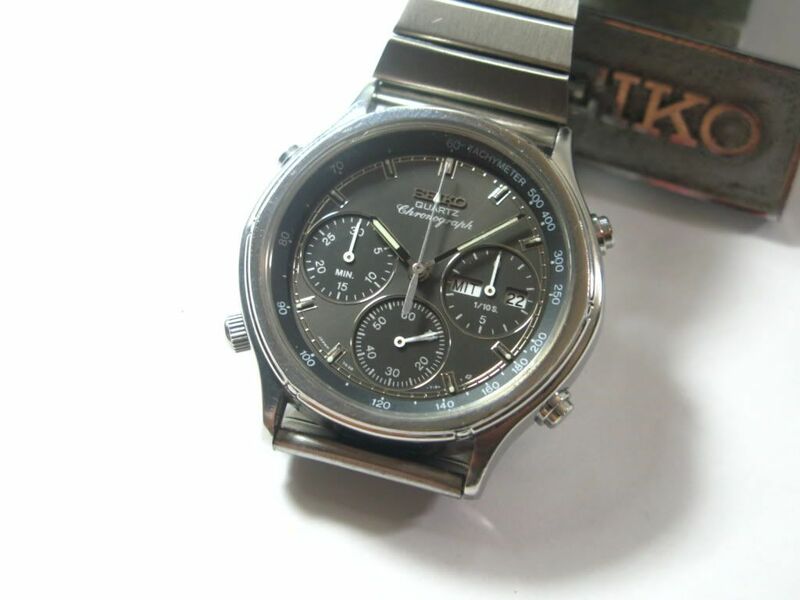 This stainless 7A38-7260 was listed on eBay in October 2011. I think it was by a UK seller, but I can't be sure. 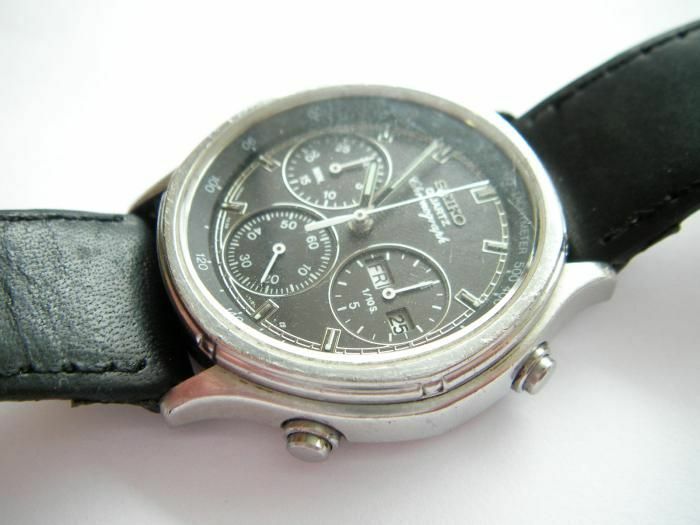 Case and bezel (particularly near 2 o'clock) have numerous light dings and scratches, although the strap may well have been original. James was correct in his statement 'Italian, got a watch shop'. The eBay seller Tentazioni72 was indeed a 'bricks and mortar' business. From what I remember by googling them, they're a small retail jewelley chain with shops across Italy. This one was in Albignasego, PD. I didn't attach any great significance to this at the time. 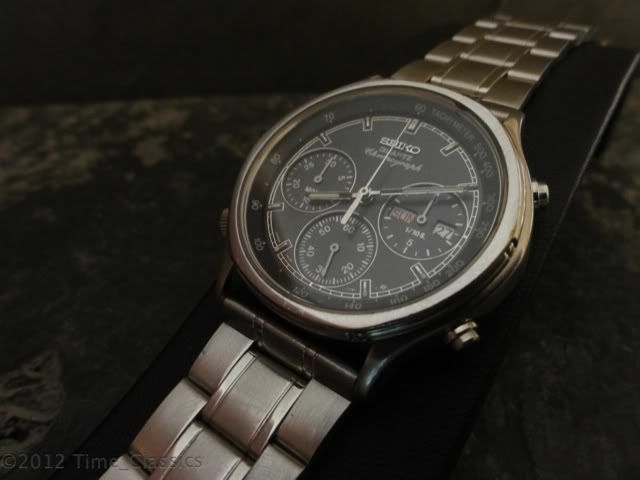 Here are a few photos of the watch I took on the last weekend in June 2011. The light wasn't ideal and the pictures aren't the best. by 10.5mm deep. Length over lugs: 41.5mm. 20mm lug width fitting. 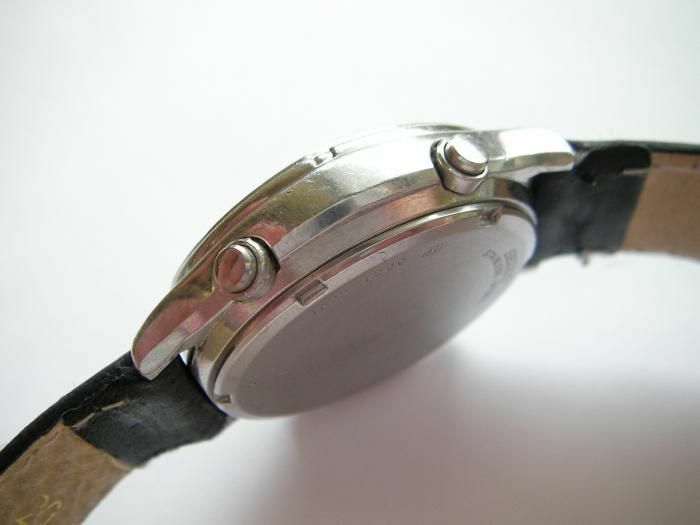 Strap fixing by double-ended shouldered 1.5mm Ø spring bars. 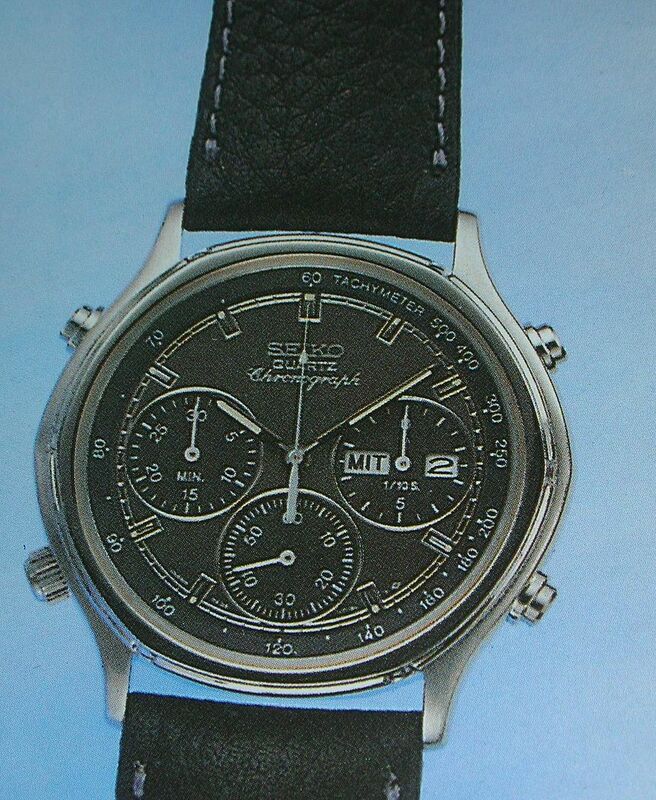 Photo (rather than a scan) of the illustration of the 7A38-7260 SAA097J from the 1988 German Seiko catalogue, courtesy of 'Kurt'. 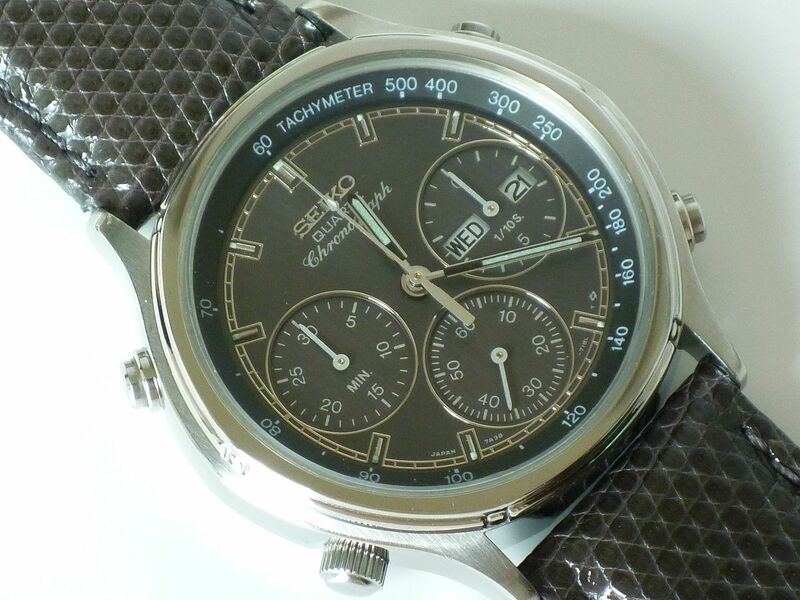 It's unusual to see a 7A38-7260 - whether stainless, or the two-tone and gold-plated versions (and the related 7A38-726A) fitted with anything other than leather straps - because that's how they left the Seiko factory. 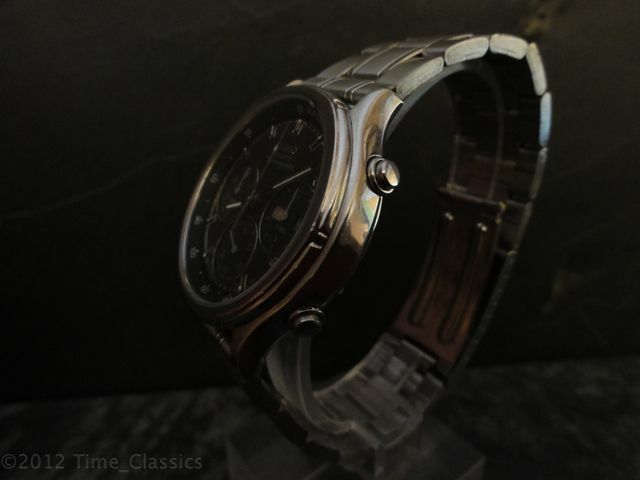 Unlike the 7A38-7240 / -724A / -7250 / -725A that all used the same watch case, there was never any bracelet option offered on the 7A38-726x model variants. 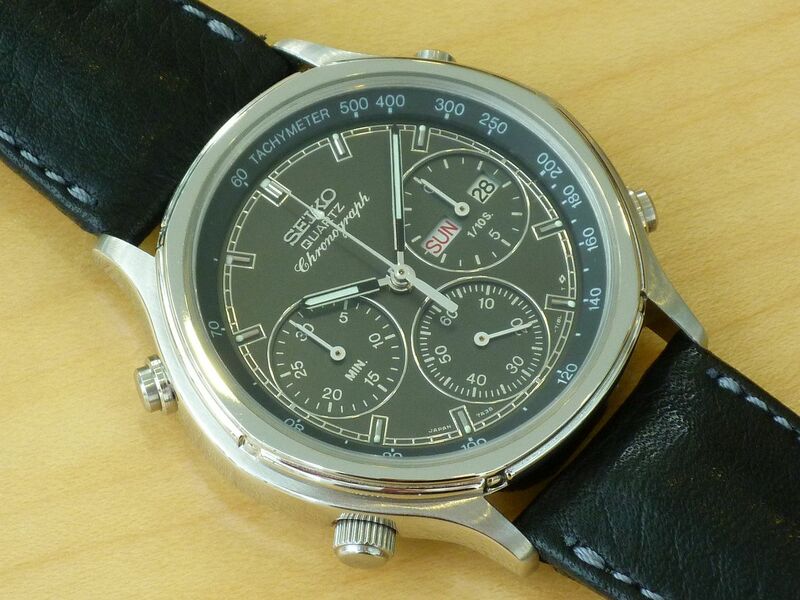 I've only ever seen one stainless 7A38-7260 fitted with a bracelet on eBay (the same watch, twice in fact). DIAL: Original dial in good condition. German/English wheel. All functions work. 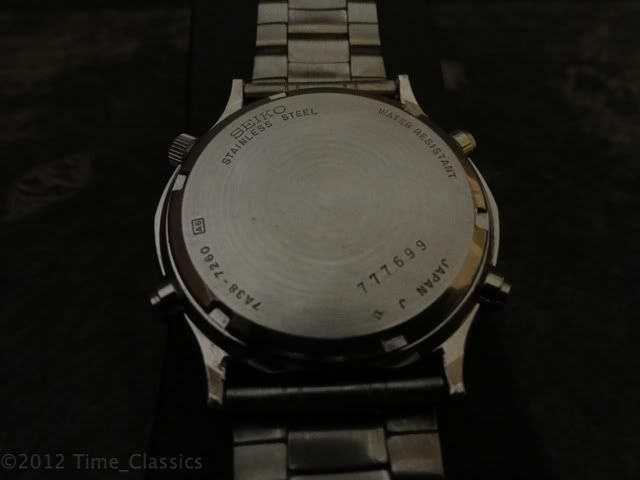 MOVEMENT: Service history unknown.... watch keeps time. I've only uploaded 4 of the total 8 of José's original listing photos, because they were all very similar. The others can still be viewed. 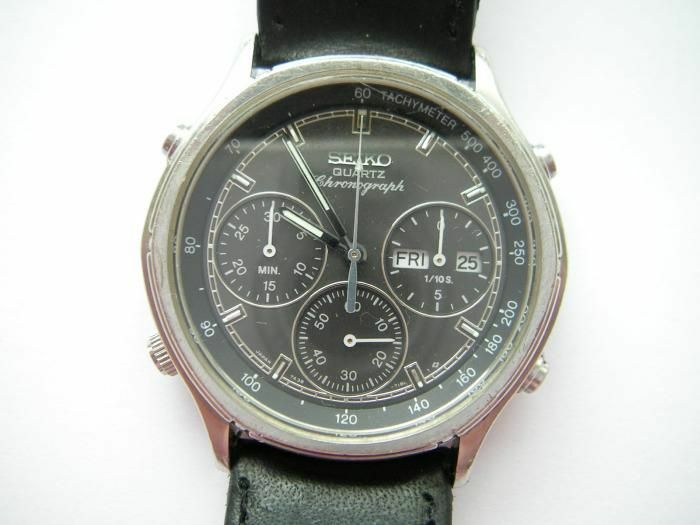 Although José made a couple of uncharacteristic typos, in both the listing title (model #) and the date of manufacture (July 1987), as with all his eBay listings, the watch was accurately and honestly described. 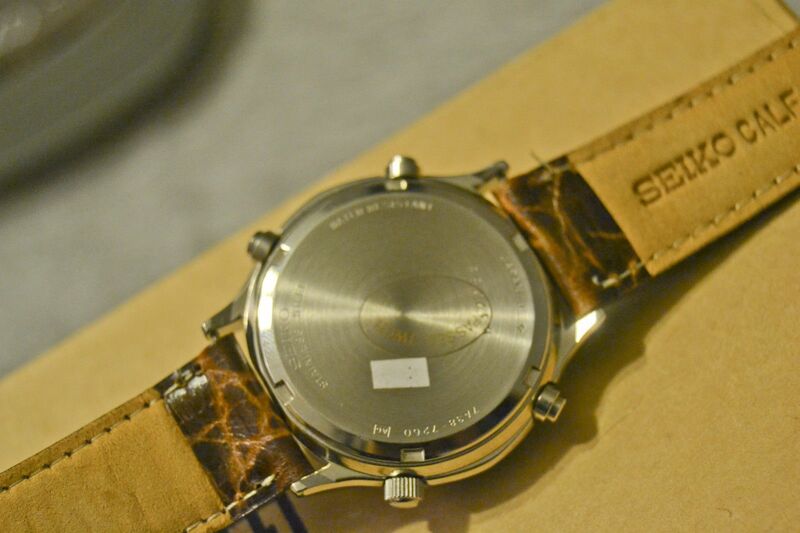 It appeared to be in quite good condition, with minimal scuffing on the top surface of the bezel. 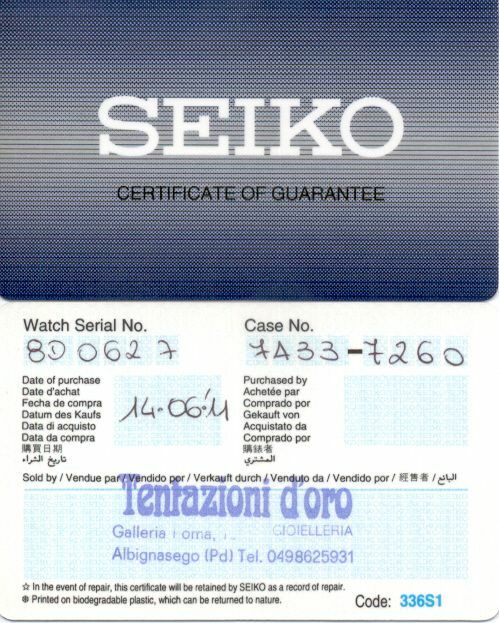 All that really let it down was the cheap after-market 'Feiko' repro' bracelet that was fitted. Note also this one had a 777xxx serial number: specifically 777899 - quite an easy one to remember. It sold for $89.88 (approx £58) after 15 bids. The auction received 441 views over the 7-day listing period. 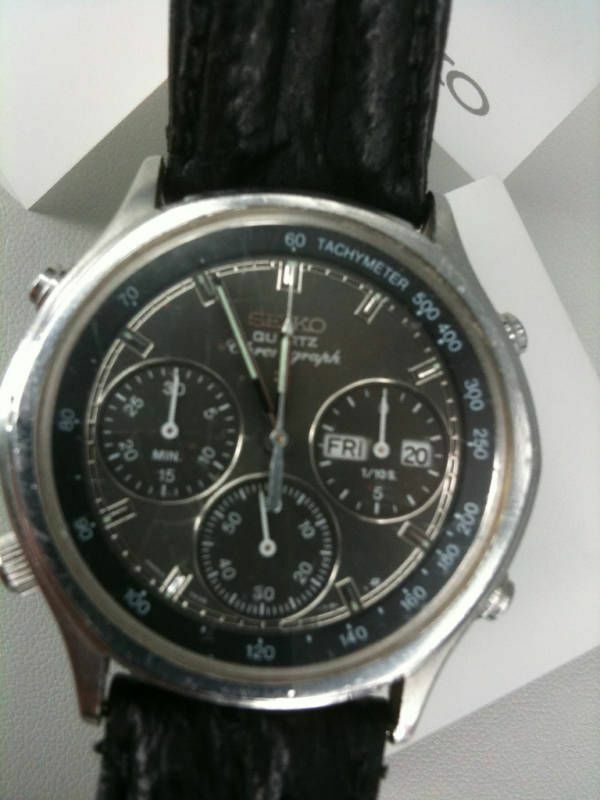 One didn't need a particularly long memory to remember that 777xxx serial number, either, because the watch was soon back on eBay. The winning bidder was Steve Jones - a profiteering UK eBay re-seller whose ID was Time_Classics; later becoming Timely_Classic. 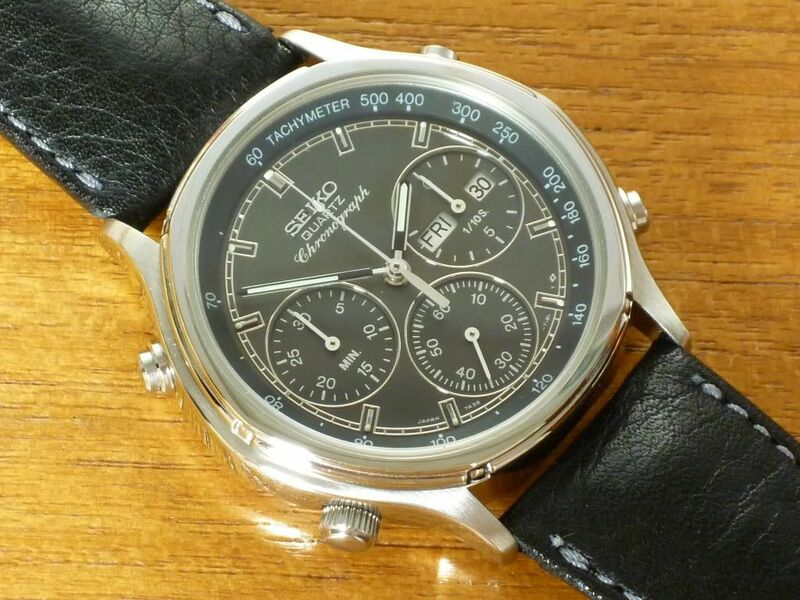 They are notorious for grossly exaggerating the condition of the watches they offer; their purposely dark badly-lit photos, and deliberately misleading descriptions (usually by omission). Yesterday evening they listed a stainless dark-grey faced 7A38-7260. 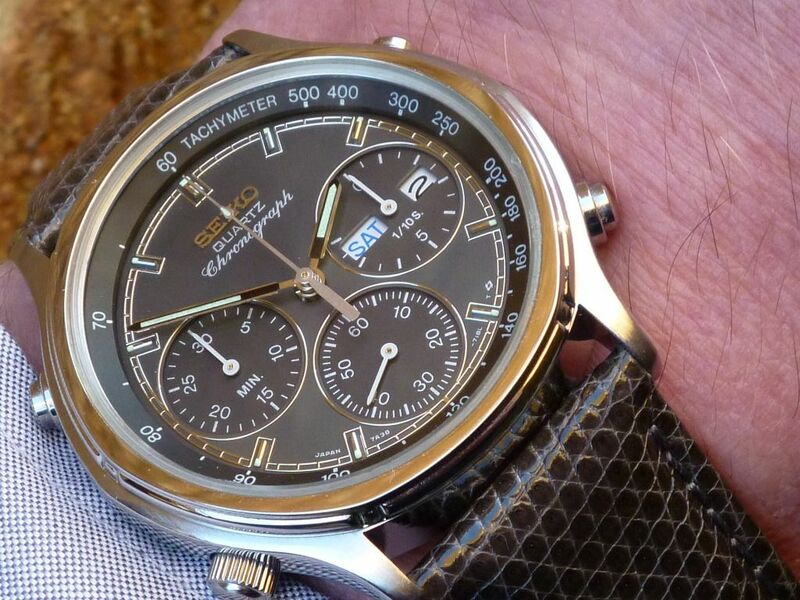 Like all their other watches, this one is STUNNING SERVICED AWESOME! 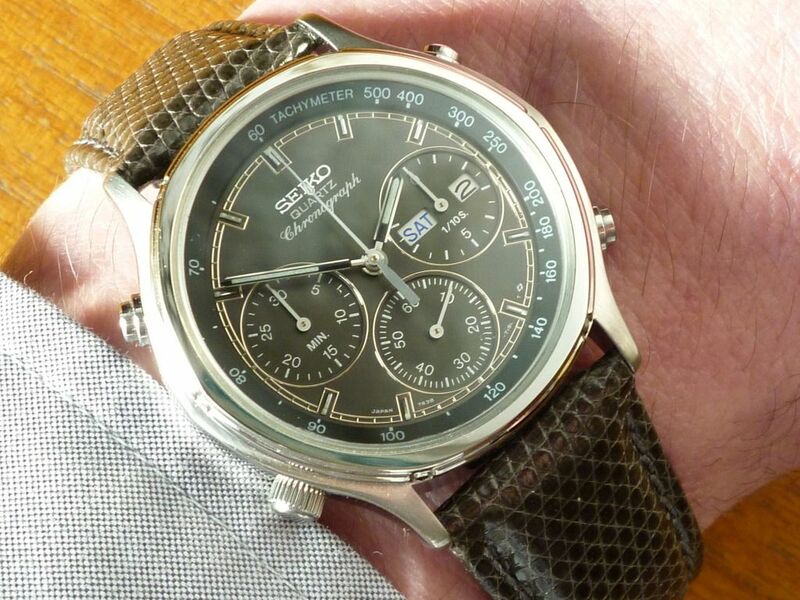 Nothing particularly wrong with it, other than the fact that it's been fitted with a totally wrong bracelet (Seiko only offered the 7A38-7260 and -726A models on leather straps) - but to the more eagle-eyed amongst us, it might just look a bit (too) familiar. 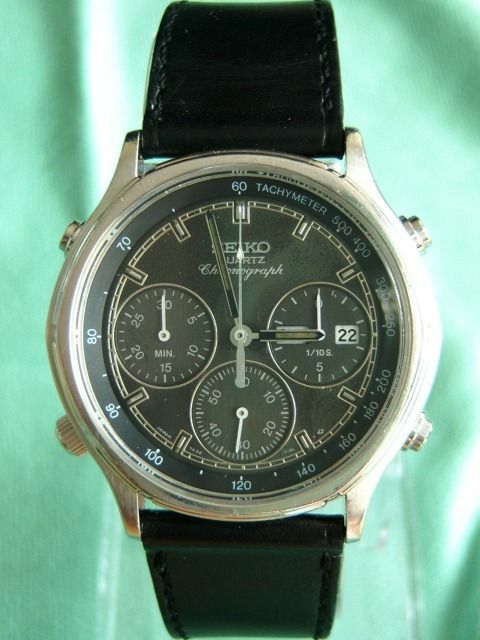 RARE 1987 SEIKO 7A38 7260 CHRONOGRAPH STUNNING SERVICED AWESOME! 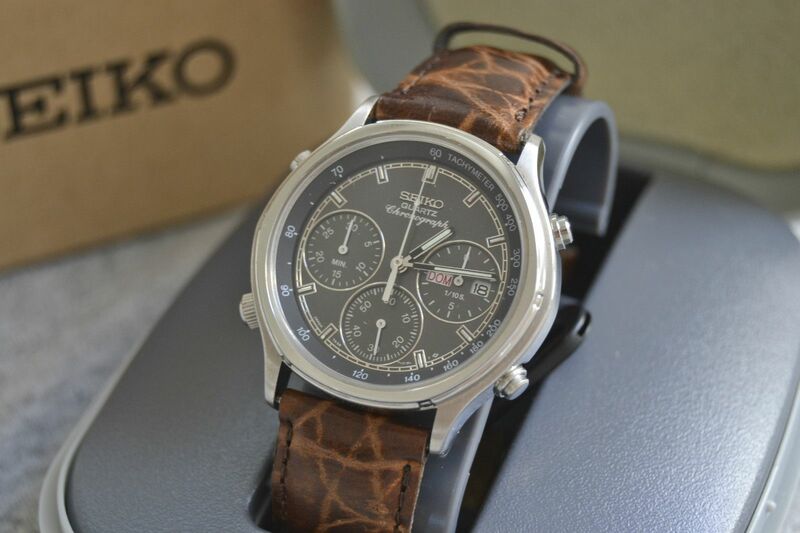 Here we have a Vintage Retro Seiko 3 Subdial Chronograph watch it has tripple sub-dials at 3 6 and 9 and is physically in great shape. 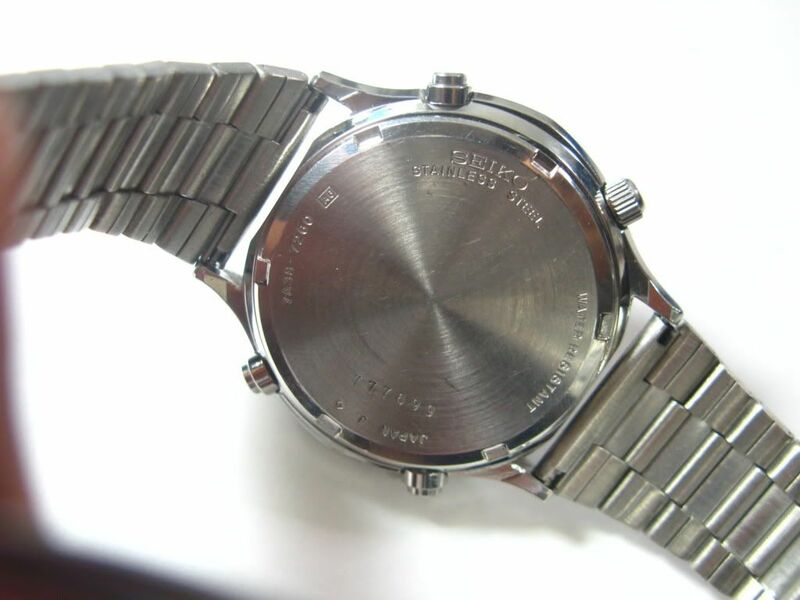 These ones have the Day Date window also making this quite a complex watch back in the 80's. 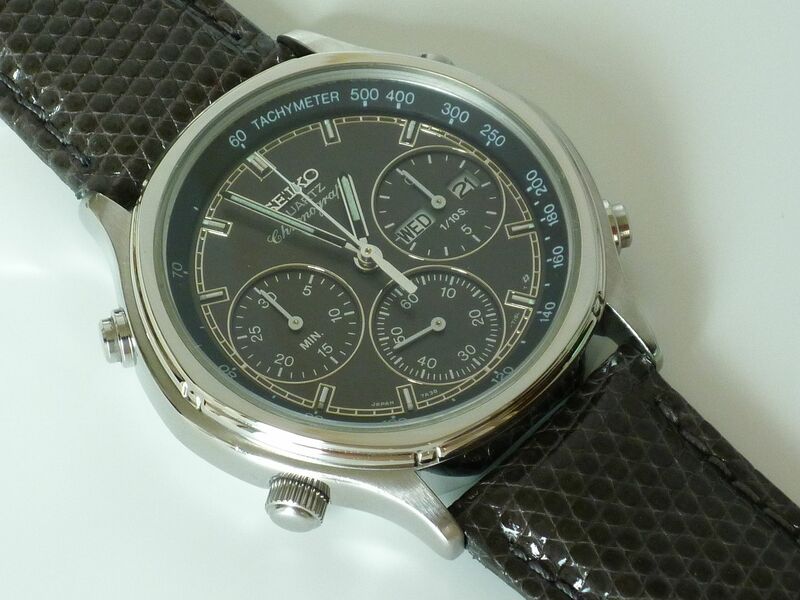 It is in fantastic used condition and is showing natural signs of age and wear, please study the photos to get a good idea of just how stunning this watch is. Was very tempting to keep this one myself actually! 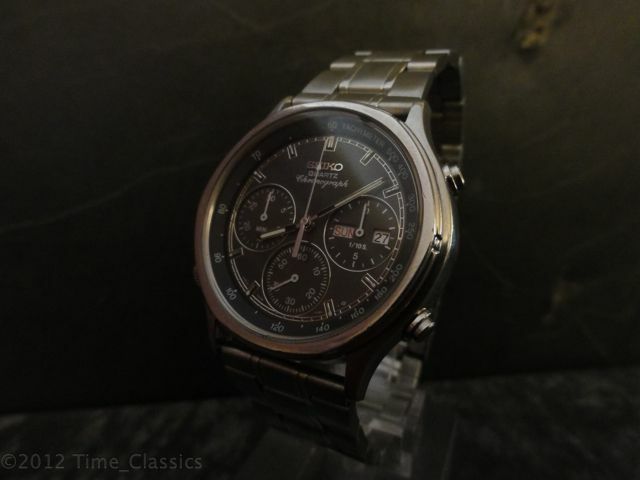 All the functions work perfectly, and the chrono works perfect and the chronograph functions all work as they should resetting at 12, and the watch is running strong. 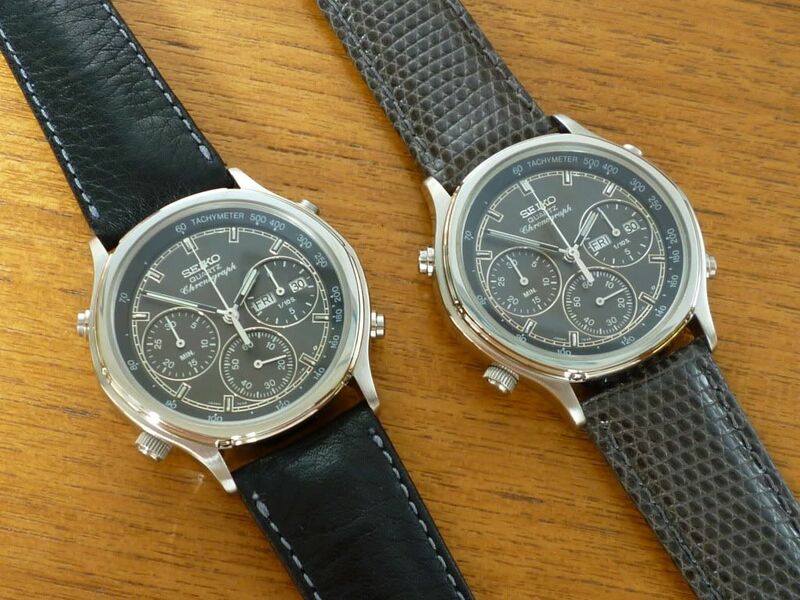 These are a rare find in this condition and would be a great addition to any collection, the watch has a retro appeal and is massive in size. 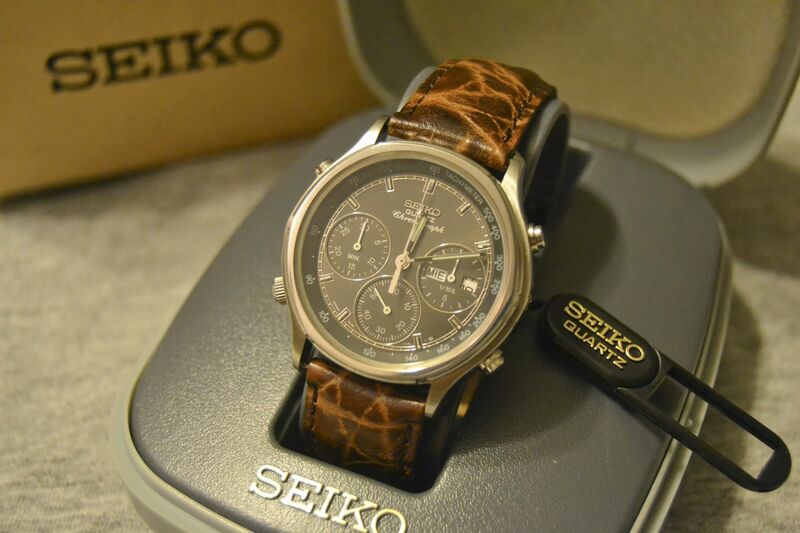 These are one of the coolest retro chrono's seiko made. 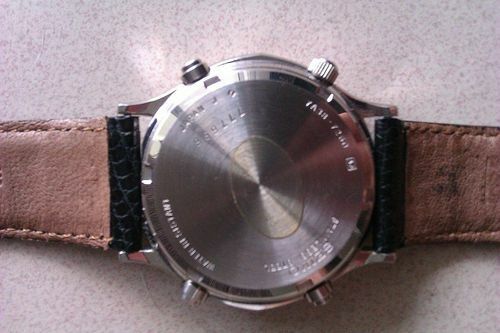 Movement: Original Caliber 7A38 Cleaned and serviced. Case/Bezel: No knocks or dents at all and really nothing worth mentioning, please see photos. I've only bothered uploading 4 of their 15 original deliberately dark dimly-lit listing photos. I'll let their description speak for itself. Fitted with an even more ill-matching aftermarket bracelet and so enthusiastically described it made £88.00 after 16 bids this time. 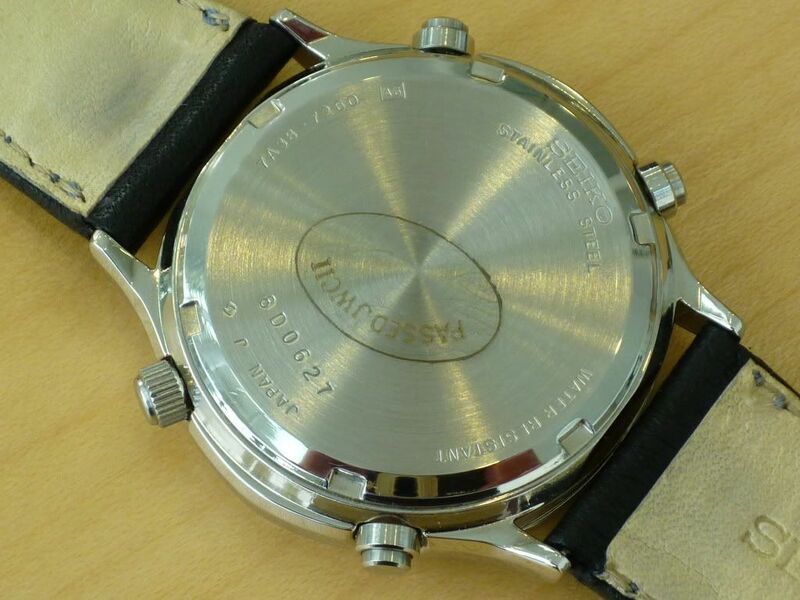 Here's the photos I saved from another listing for a stainless 7A38-7260 on eBay Germany in July last year (2012). Unfortunately I didn't make a note of the price it sold for, at the time and I can't find the original eBay listing, either. It appeared to be in almost mint condition, very little worn, with a yellowed JWC inspection sticker still in place on the case-back. 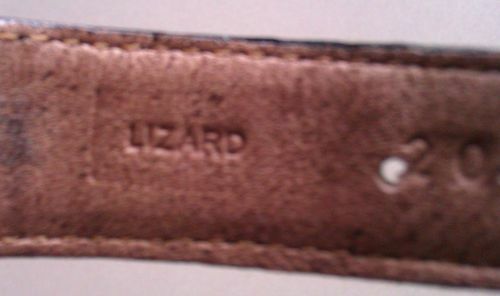 The strap wasn't original, but a black or very dark grey lizard strap, which I remember made me smile to myself when I saw it. Yet another example of a stainless 7A38-7260 SAA097J with a 777xxx serial number, too. 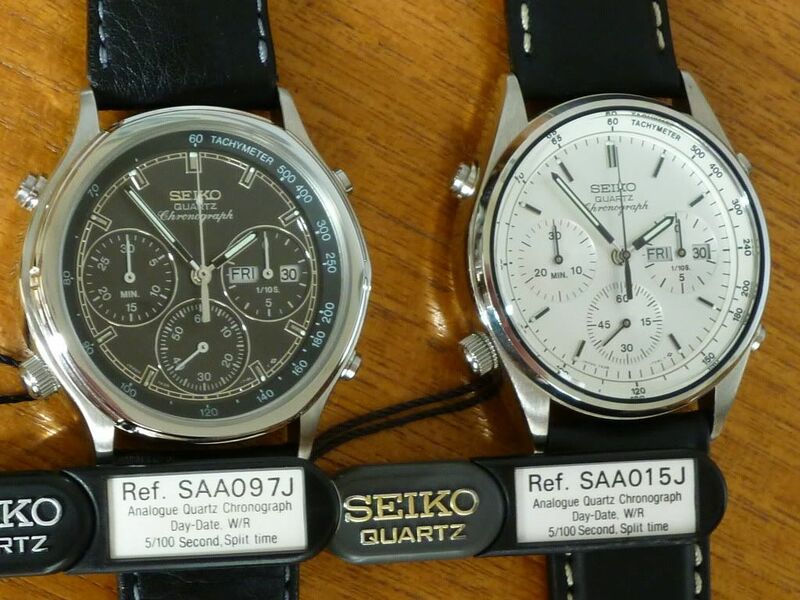 To give you some idea of the disparity in prices that you may see asked for these, here are three examples seen on eBay Italy in April. The first one was originally listed as far back as the beginning of February. IIRC, the original Buy-it-Now asking price was 100 Euros. The photo(s) didn't get much better for clicking on. 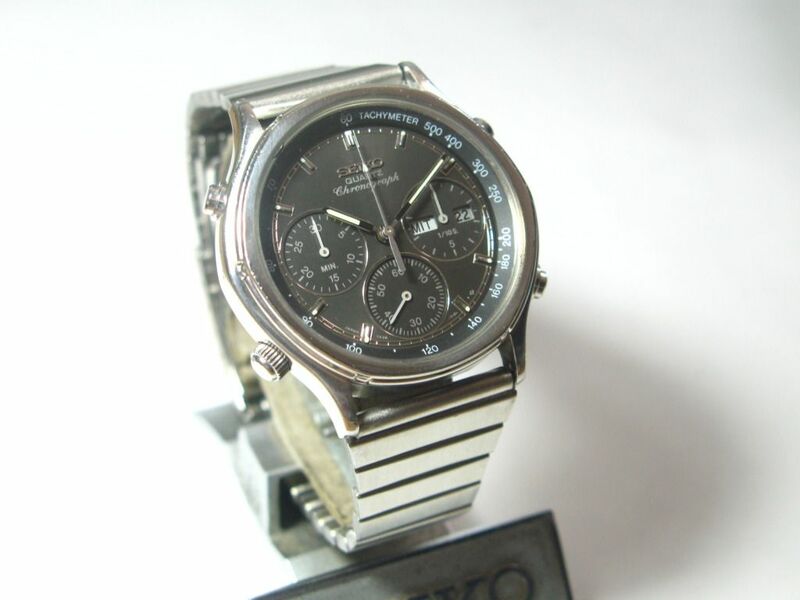 Questo orologio è un must della seiko 7A38-7260, ottimo orologio da collezione, molto raro, dalle foto vedrete benissimo la condizione dell'oggetto, che viene venduto senza cinturino originale, con 10 euro potrete cambiare il vetro che è graffiato e avrete un orologio come nuovo che farebbe invidia ad ogni collezionista di orologi. 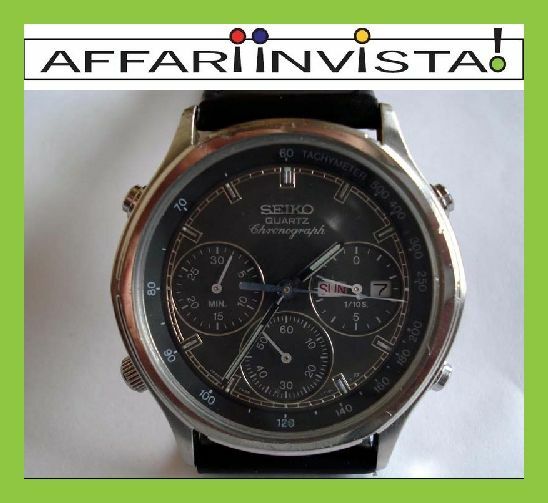 E' un orologio talmente raro che in italia sono l'unico rivenditore che lo vende su ebay, potrete trovarlo solamente nell'ebay estero, ma mai in italia!!!! Apart from the diabolical photos, it was being sold with a chronograph fault, for spares or repairs. But somebody eventually bought it. 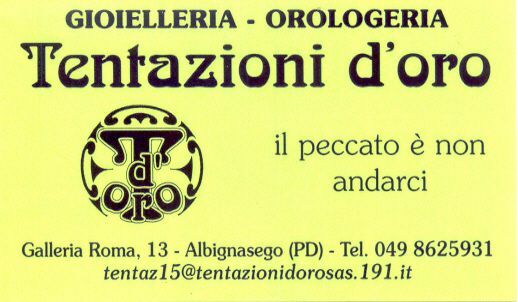 Orologio funzionante e ben tenuto. 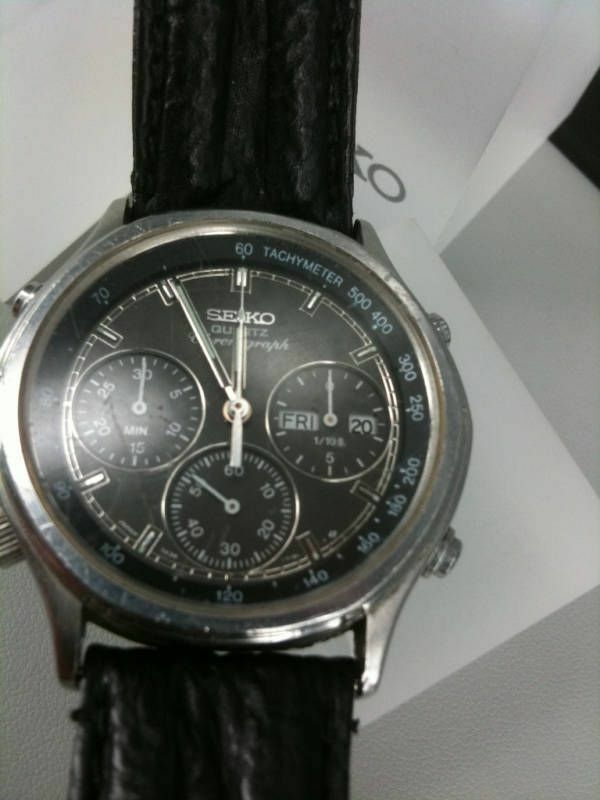 From the single photo, the watch appeared to be in good cosmetic condition and still fitted with the original Seiko p/n BRA35S strap. I was almost tempted to go for it myself (I did bid), but as I already had two nice examples in my collection, I really couldn't justify it. It sold for a mere 54 Euros (approx. 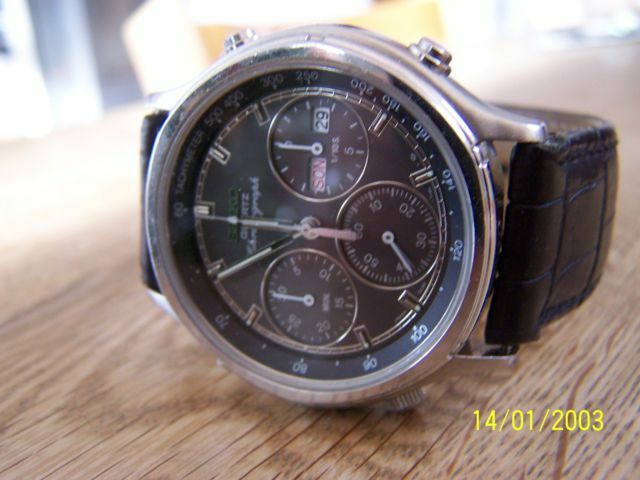 £45.40) after 17 bids. The auction received only 129 views over the 10 day listing period. 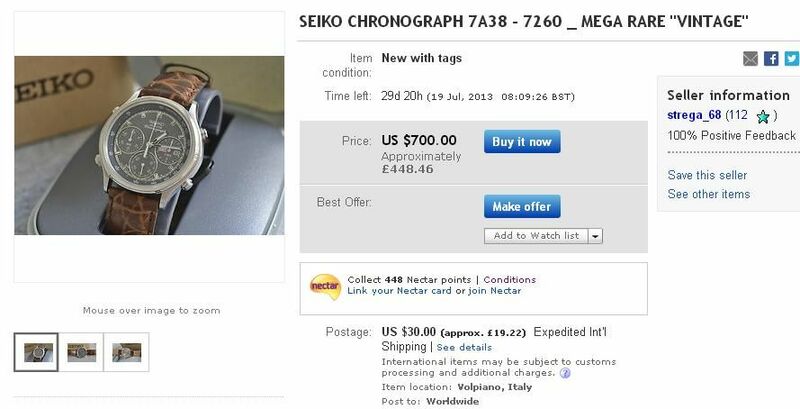 Then there was this one, claiming to be 'New with tags' listed by strega_68 - already mentioned in the eBay 'Craziest prices' thread. Funnily enough, it was (quite ironically, I thought) listed - for 30 days, only a few hours after the previous auction ended. 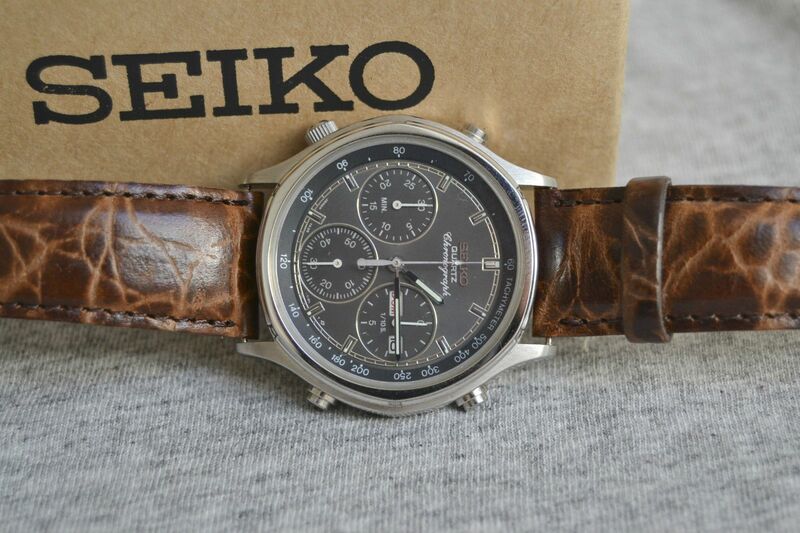 SEIKO CHRONOGRAPH 7A38 - 7260 _ MEGA RARE "VINTAGE"
It may be 'all original Seiko'. but that 'mock croc' (or is it fake alligator ?) 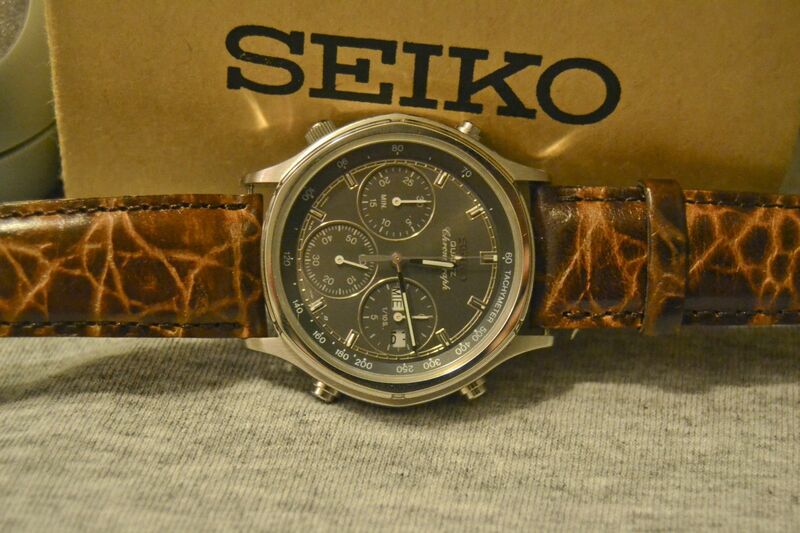 Seiko Calf strap certainly isn't original to this watch. As for the 'pie-in-the-sky' $1250 asking price - I guess this one will be re-listed (for 30 days at a time) a few times over yet ! 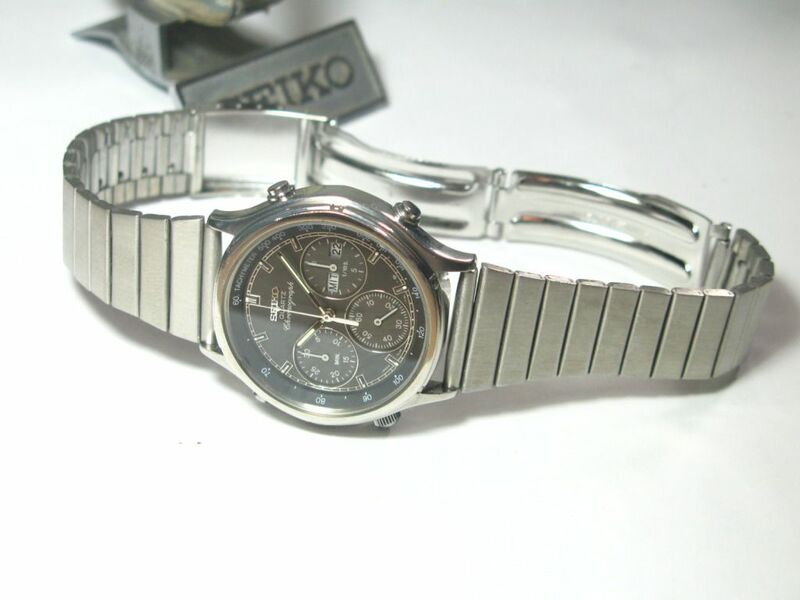 Rare 1980s Seiko Quartz Chronograph 7A38-7260 Day/Date Tachymeter, Black Dial. Strap Military type fabric. Excellent condition. Crystal condition Good condition. A few light scratches. 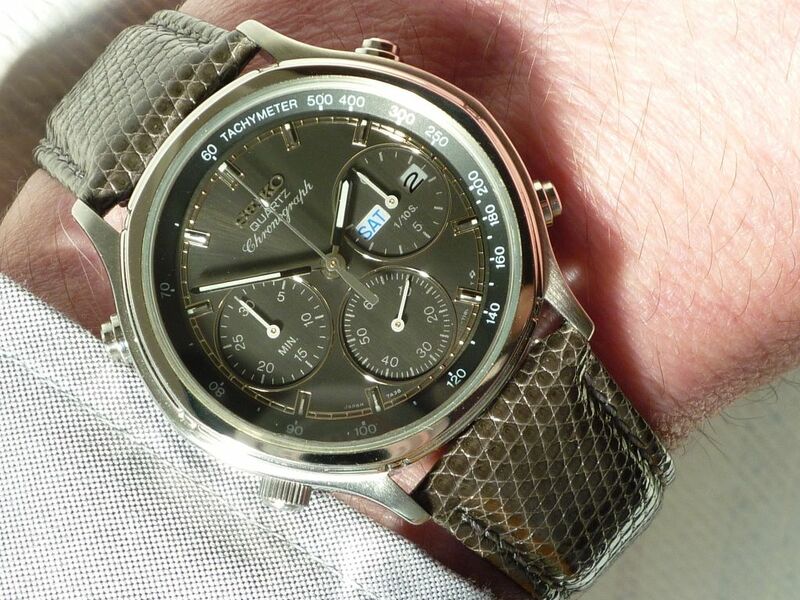 By claiming that the dial is 'Black', (rather than it's true metallic dark grey colour), and by fitting it with a cheap Olive Green NATO strap, the seller is clearly trying to appeal to 'military-look' watch collectors. 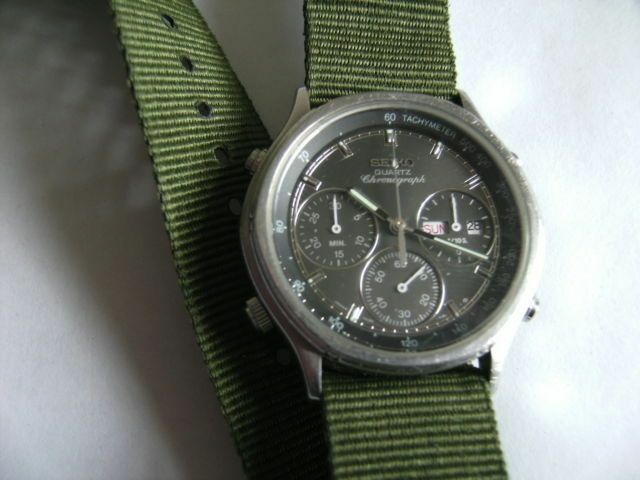 This isn't a miltary watch - it's actually quite dressy. 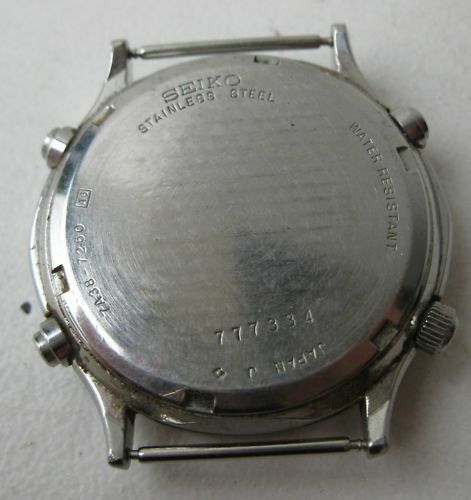 Edit(s): I just noticed the case-back serial number of this most recently listed stainless 7A38-7260 - it's 777112. 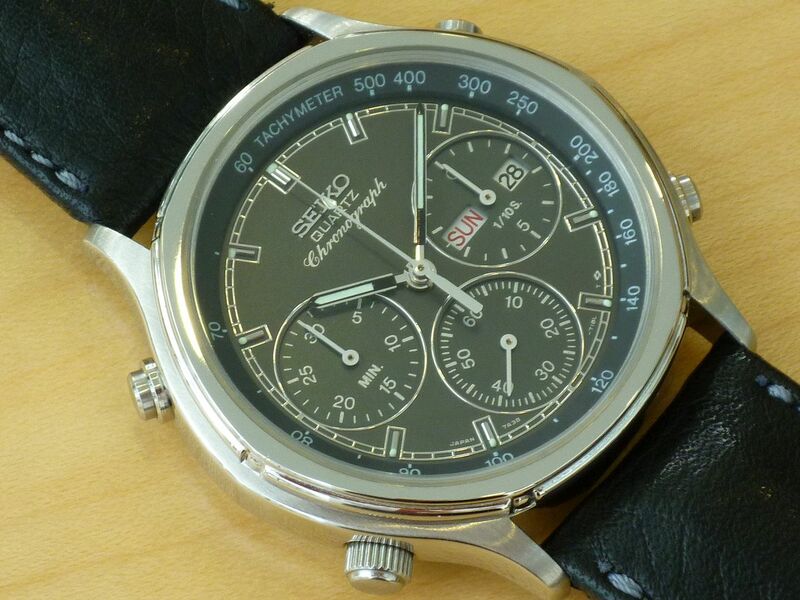 Which may also have been originally fitted (at that time) with the correct original Seiko p/n BRA35S leather strap. Those photos give a rather clearer picture of the fairly pitted condition of the case and bezel. Caveat Emptor, Gentlemen. Belated edits: It was subsequently re-listed twice @ £150 as eBay item #'s 221230595820 and 221235108178 and again went unsold. 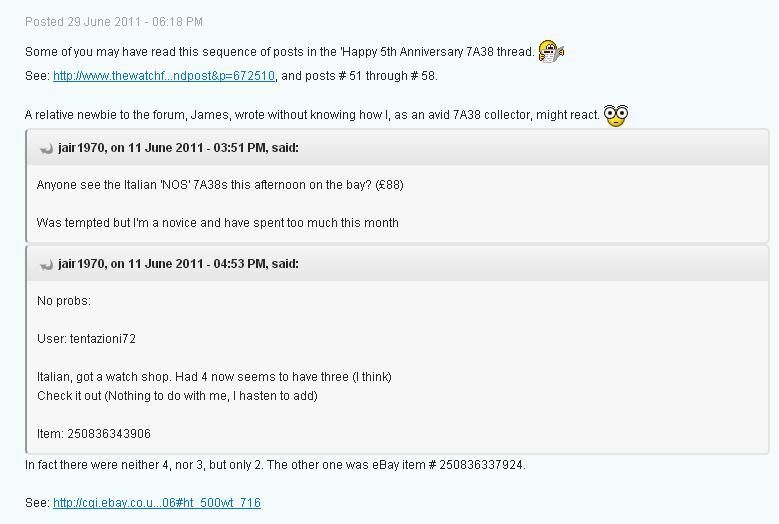 Italian seller Strega_68's grossly over-priced 'NOS' 7A38-7260 also went unsold, after having declined a 'sensible' best offer of $250. It's just been re-listed - now reduced from the previous Buy-it-Now price of $1250 to 'only' $1000. I'm sure the 3 slightly different photos he's used in this listing will make a world of difference (not). The seller declined a low-ball offer of £50 against the latter, before reducing it once again to £95, for which it finally sold on 5th July. Or maybe it didn't. 'Cos it's back once again ! I daren't ask (what the error was this time). Suffice to say, this person, Stephen Adams is another eBay business seller I would give a very wide berth to. 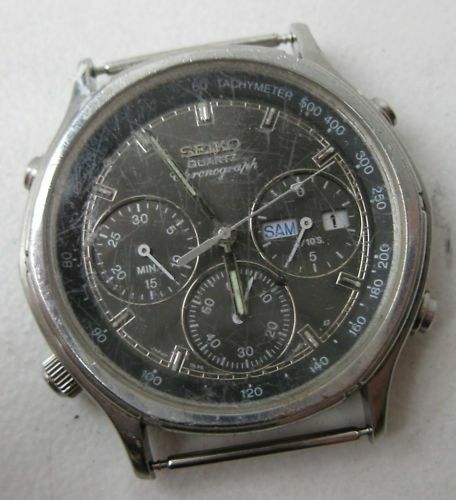 Italian eBay seller Strega_68's 7A38-7260 had been re-listed (for 30 days at a time) maybe half a dozen times since. 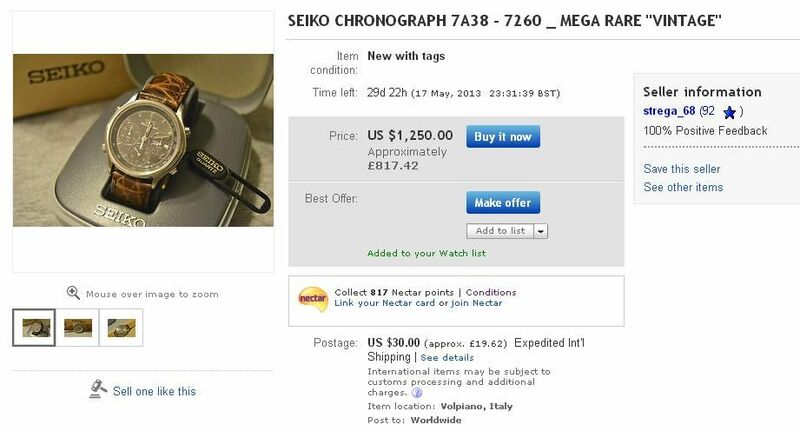 It had got to the point where I didn't even notice he'd reduced the price from $700 to 'only' $650 (nearly half his original ridiculous $1250 asking price). In fact, it had become such a constant that I almost missed it dropping off the bottom of my eBay watching page early this morning. And exactly how much did he finally let it go for ? Remember my post of May 19th ? I reckon at today's £/$ conversion rates £151.57 equates to $250 ! In response to that last post regarding the Ebay Auction dropping off, I'm the winner of that auction. I was actually a bit nervous after reading some posts about the watch (after submitting my best offer), but after reading a few more on here I'm a bit more comfortable. Plus the seller seems legit (according to his feedback). I will be changing that band out for something authentic (if possible). 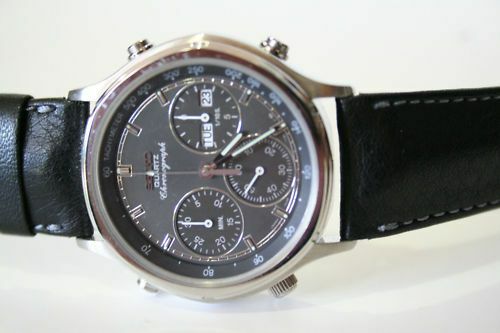 For those of you who own this watch, how do you like it's accuracy? 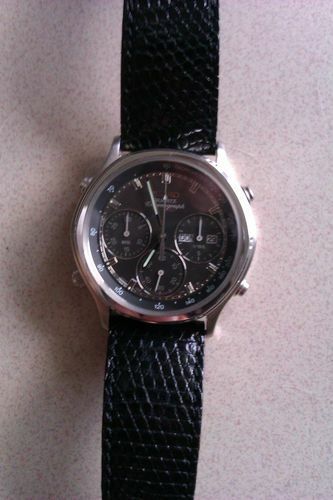 And a question to those who have purchased this watch off of ebay or from overseas. 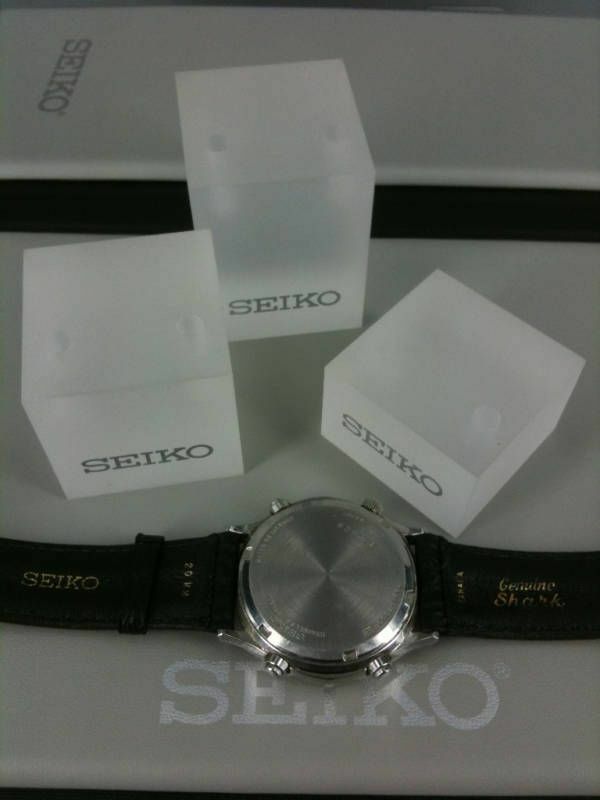 Have you received authentic watches or copies? I'll let you all know once it's received. Well done Tom ! I'd say that the $250 you got it for is a pretty reasonable price in today's marketplace. I will admit it was I who offered $250 previously back in May, tongue in cheek, against his then ludicrous asking price of $1250 - knowing full well it would be rejected. Besides, as you can see I already have 2 quite nice examples: one NOS on the original strap - so why would I really want another ? 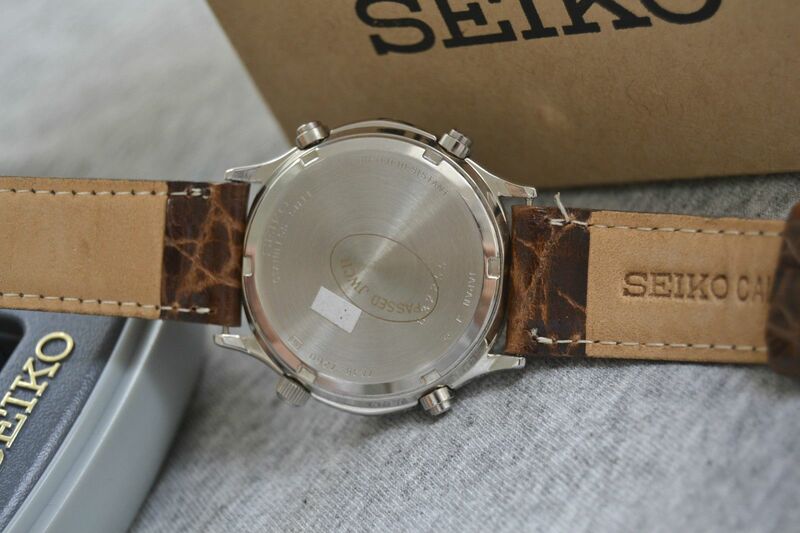 Yes there's something odd about the strap fitted - not just the incongrous 'mock croc' finish, but it appears it might actually be a 19mm strap (in a 20mm lug width). 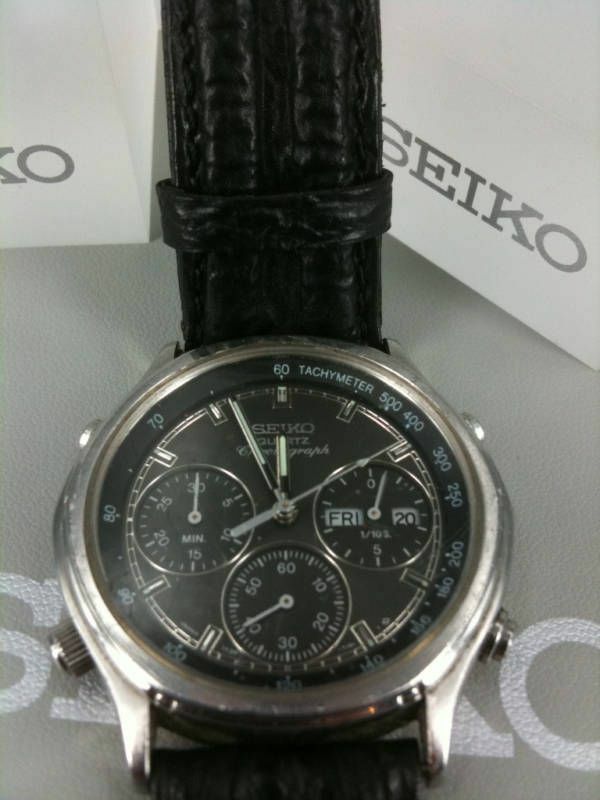 Rather than go black, you might want to consider a very dark grey strap. May I recommend lizard ? 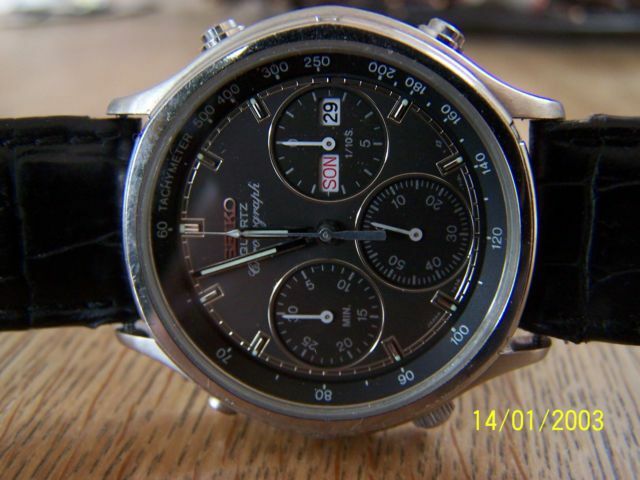 These watches are normally superbly accurate - though not quite to COSC standards. 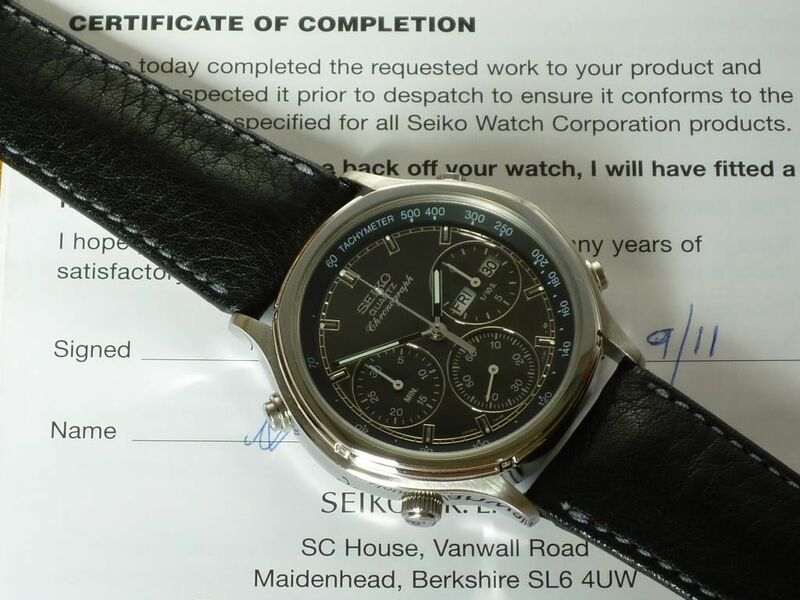 The NOS one I bought had major timekeeping issues - it needed a service, which it got (FOC) courtesy of Seiko UK (under warranty !!) and ever since then it's kept perfect time. I have a few Seikos, Orients, and Citizens in the mix with many other Swiss brands. I'm a big fan of manual winds and automatics from those companies. I only have two quartz watches in my collection. 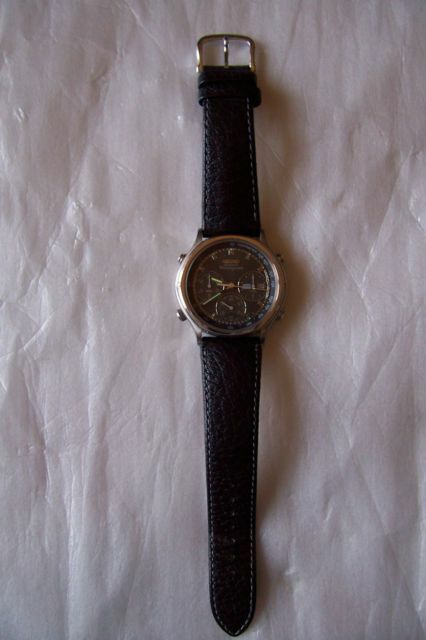 Where would be the best place to buy straps for this watch? That lizard you mentioned sounds interesting. Thomas. 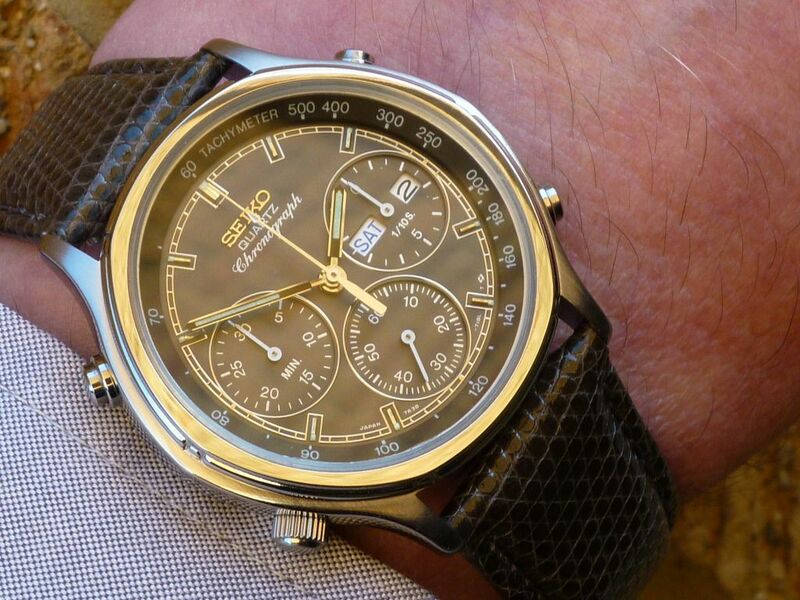 Strap choice is very much a personal thing, but to my mind it can 'make or break' a watch. You could easily spend anything between $15 and $50 (or more) and still not be happy. I have a list of preferred watch strap retailers, but they are mostly in Europe. See the bottom of the Other Links page. 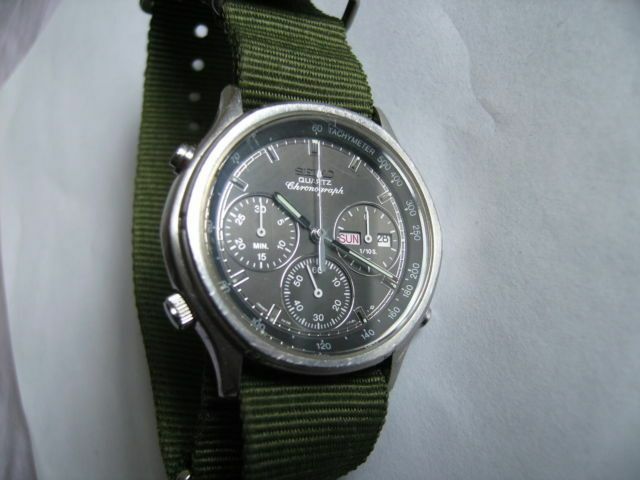 There are many similar online watch strap sellers Stateside, plus of course eBay. What are you going to try for ? 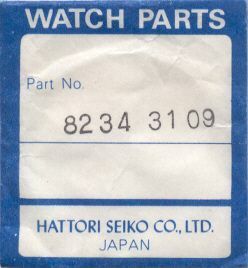 To match the original Seiko p/n BRA35S strap ? 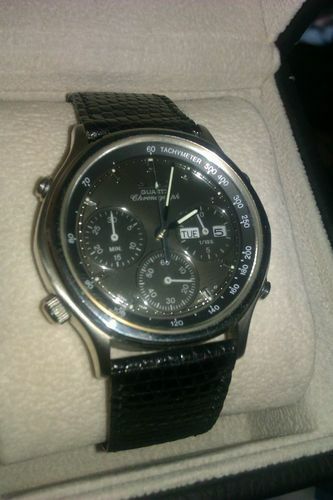 It's nice to have one, but I don't personally think it does the watch any favours. It's matt black buffalo / calf grain with light silvery grey stitching. 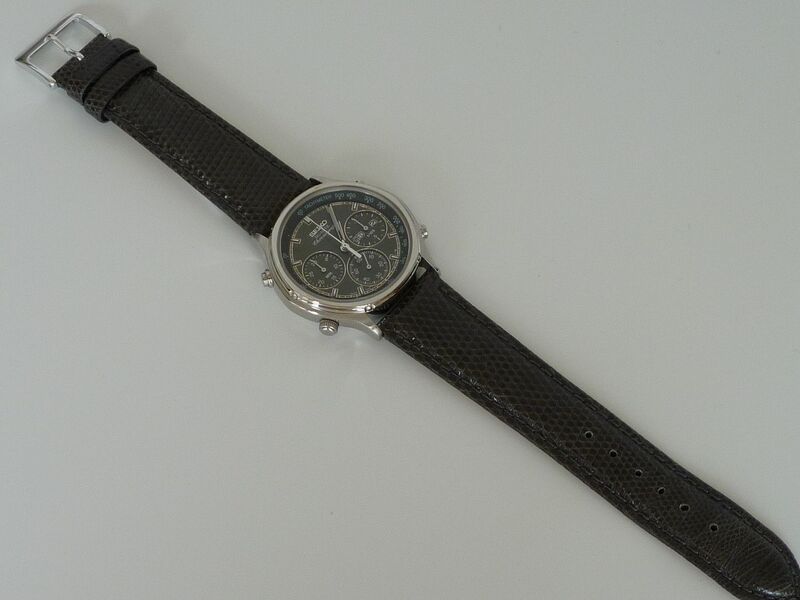 So there are hundreds of different black leather straps with light or white stitching you could choose from. 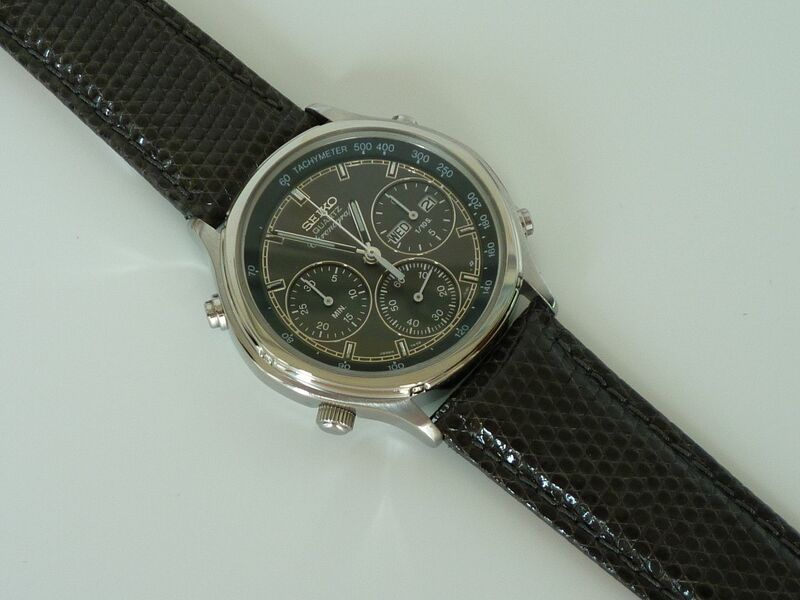 When you receive the watch you'll see that the main dial colour is actually a very dark metallic grey - not black. That was what made me decide to go for patent dark grey lizard on my first stainless 7A38-7260. Meanwhile, the day before Thomas and I had our little exchange, another stainless 7A38-7260 had been listed on eBay Germany. Unfortunately, as is sometimes the case, the auction was poorly titled; no mention of the magic 7A38 word in description either. 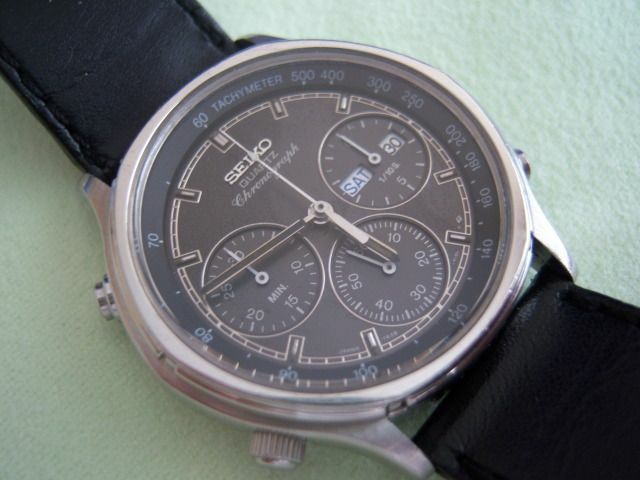 Biete aus meiner Sammlung einen Seiko Chronograph aus den 90ern an. War mal meine Lieblingsuhr (damals) lag aber seit vielen Jahren in der Uhrenbox. Ich habe eine neue Batterie reingemacht und sie einige Tage gestestet. Alle Funktionen sind einwandfrei gelaufen. Die Uhr verfügt über eine Wochentagsanzeige und eine Datumsanzeige. Außerdem stoppt sie bis auf die 1/10 Sekunde! Über den Drücker auf der 10 kann man Zwischenzeiten stoppen. Die Stegbreite beträgt 20mm, der Gehäusedurchmesser ca. 39mm (wirkt aber etwas kleiner). 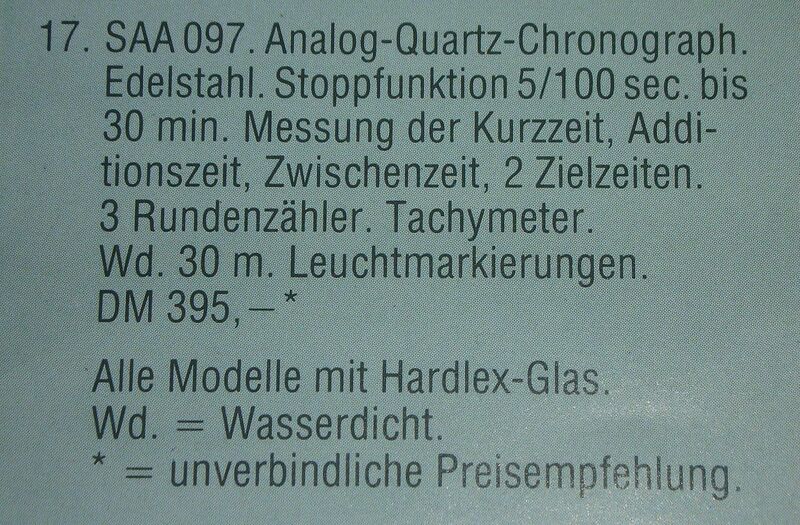 Auf dem Mineralglas konnte ich keine Kratzer oder ähnliches feststellen, das Edelstahlgehäuse hat die üblichen Gebrauchsspuren. However, from the photos it looked to be in pretty reasonable cosmetic condition with only light scratches on the bezel, so still attracted a fair amount of attention. The auction ended a few moments ago @ 68 Euros (approx. £56.42) after 22 bids by 11 diiferent bidders.